USSP: Unique Study Support Program for Extra- Meritorious Students. It includes Course fee rebate, Hostel Fee rebate upto 100%. *Aggregate means total of all subject given in final marksheet issued by board. Note: Student can avail scholarship in one criterian only (Whichever is higher). Student eligible for schoalrship is required to bring supporting original documents at the time of admission/ reporting for verification. *SLEEE: State level Engineering Examination like CET, BITSAT, WB JEE etc. Achievement Award: All Students selected in JEE Advanced, JEE Main, NEET from Career Point are honored by Achievement Award and Momentous in the celebration party held in Kota. Test Result Result will be declare on the same day. 100% rebate in Hostel fee (for air cooled double room on twin sharing basis). 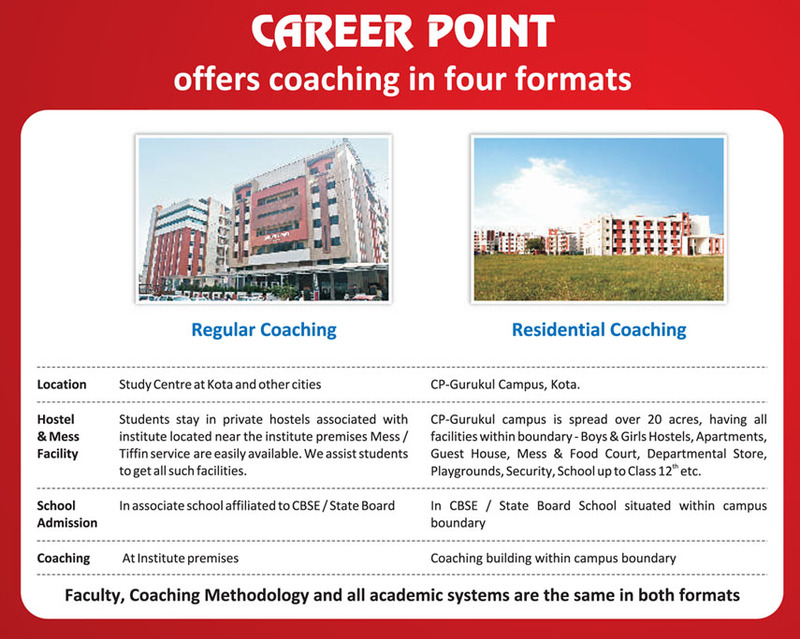 Hostel facility will be provided at "Career Point Gurukul"
Mess Charges: Student has to pay Rs. 3500/- per month for the food. Electricity Charges: If air conditioned room is opted then student has to pay difference amount of room rent and electricity as applicable. Student eligible for scholarship is required to show the supporting documents in original on admission/reporting. Before 5thday of each month student performance in internal tests will be reviewed for extension of hostel fee rebate for subsequent month as per the criteria give above. In case the student is irregular or his/her performance falls below expectation then Career Point will withdraw USSP & student has to pay full hostel fee OR may be asked to vacate the hostel. Student has to follow all rules and regulation of Hostel & Institution. In case of default, USSP will be withdrawn and student may be asked to vacate hostel. In all matters, decision of Career Point’s Director will be final and binding. Objective: UDAAN-2017 is a comprehensive program initiated by Career Point India Ltd Kota. Providing free CBSE Schooling, Scholarship in coaching fee and attractive prizes to talented students studying in classes IV to XI. Criteria	Career Point conduct CP-STAR exam all across the nation in the month of October and based on performance in this exam. Scholarship	Rebate on Course Fee upto 100% + Free Hostel Facility. Note: The above fee is till 31st March 2020. If student stay beyond 31st March 2020 then hostel fee shall be charged for the over stayed period. For 1/2 BHK Flats: Mess & food charges are not included in the fee.